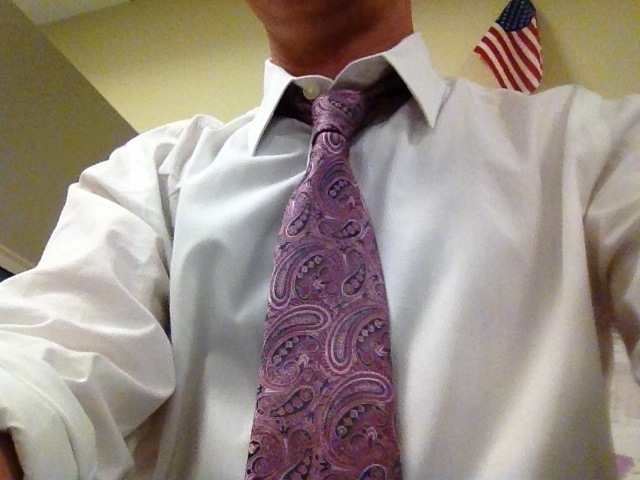 Day 2 comes at a good time because this particular tie was bought to coordinate with a pink shirt. That pink shirt fell victim to a red wine accident and this pink tie hasnt been worn in over a year. I haven’t replaced the pink shirt because I think the pink shirt trend is nearly over. This tie has a really cool, old-school paisley pattern that reminds me of all the ties my Polish family members used to wear back in the day to weddings, Christmas and Easter Masses, and any “fancy” occasion. Paisley patterns just seem old Europe to me. The tie is from Express and is a pretty good quality silk, but it’s dimple resistant. It’s bizarre. For those who don’t know, when you tie a good tie, right in the middle of the tie, just below the knot, there should be a concave wrinkle, called the “dimple.” See Day 1. Or look at the picture at the right I stole from Jim Skeen’s blog. My tie from yesterday makes a dimple super easy. I think I could’ve fixed it and gotten a dimple if I had tied a Double-Windsor, but a Double-Windsor knot is way too bulky for an open-collar and a casual Friday. I’m wearing this tie on “casual Friday” and paired it with a white shirt (sleeves rolled up) and beaten-up Levis 559s. I call it the “1980s Stand-Up Comic” look, or the “Presidential Candidate Visits a Factory on the Campaign Trail” look. 2 down, and 42 ties to go. Who’s having fun?